A text version list of summer events and concerts will be posted shortly. 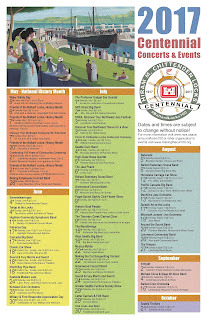 You can click on the schedule image below and either enlarge onscreen for better legibility or download it to your computer and print it out. This document is 11x17 (tabloid size). For more information visit www.nws.usace. Here is an all text version which hopefully can be used by text readers. 5th Friday, May 5 @ 11 a.m.-3:30 p.m.
6th Saturday, May 6 @ 1-3 p.m.
7th Sunday, May 7 @ 10 a.m.-3 p.m.
Children’s Build a Toy Boat 10 a.m.-2 p.m. Discover Your Northwest Centennial 5K, Kids Dash 7th Sunday, May 7 @ 9 a.m.
20th Saturday, May 20 @ 1-3 p.m.
21st Sunday, May 21 @ Noon-4 p.m. 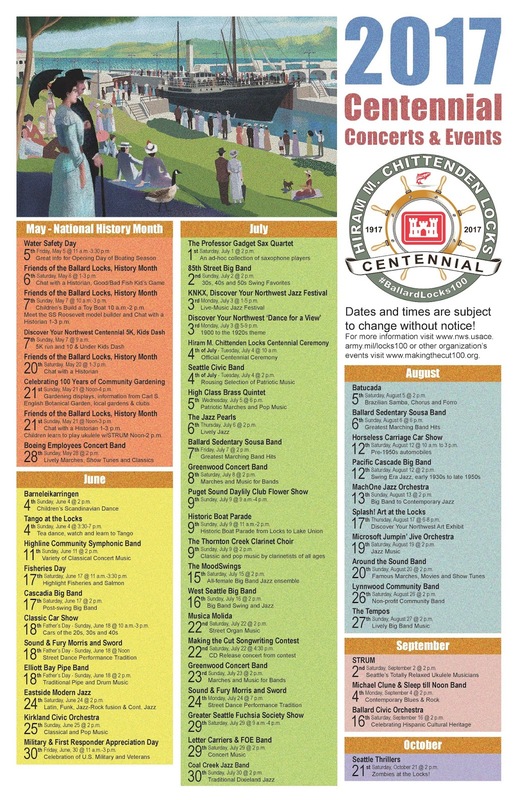 Gardening displays, information from Carl S.
21st Sunday, May 21 @ Noon-3 p.m.
Chat with a Historian 1-3 p.m.
Children learn to play ukulele w/STRUM Noon-2 p.m.
28th Sunday, May 28 @ 2 p.m.
4th Sunday, June 4 @ 2 p.m.
4th Sunday, June 4 @ 3:30-7 p.m.
11th Sunday, June 11 @ 2 p.m.
17th Saturday, June 17 @ 11 a.m.-3:30 p.m.
17th Saturday, June 17 @ 2 p.m.
18th Father’s Day - Sunday, June 18 @ 10 a.m.-3 p.m.
18th Father’s Day - Sunday, June 18 @ 2 p.m.
24th Saturday, June 24 @ 2 p.m.
25th Sunday, June 25 @ 2 p.m.
30th Friday, June, 30 @ 11 a.m.-3 p.m.
1st Saturday, July 1 @ 2 p.m.
2nd Sunday, July 2 @ 2 p.m.
3rd Monday, July 3 @ 1-5 p.m.
3rd Monday, July 3 @ 5-9 p.m.
Hiram M. Chittenden Locks Centennial Ceremony 4th of July - Tuesday, July 4 @ 10 a.m.
4th of July - Tuesday, July 4 @ 2 p.m.
5th Wednesday, July 5 @ 6 p.m.
6th Thursday, July 6 @ 2 p.m.
7th Friday, July 7 @ 2 p.m.
8th Saturday, July 8 @ 2 p.m.
9th Sunday, July 9 @ 9 a.m.-4 p.m.
9th Sunday, July 9 @ 11 a.m.-2 p.m.
9th Sunday, July 9 @ 2 p.m.
15th Saturday, July 15 @ 2 p.m.
16th Sunday, July 16 @ 2 p.m.
22nd Saturday, July 22 @ 2 p.m.
22nd Saturday, July 22 @ 4:30 p.m.
23rd Sunday, July 23 @ 2 p.m.
24th Monday, July 24 @ 7 p.m.
29th Saturday, July 29 @ 9 a.m.-4 p.m.
29th Saturday, July 29 @ 2 p.m.
Coal Creek Jazz Band 30th Sunday, July 30 @ 2 p.m.
5th Saturday, August 5 @ 2 p.m.
6th Sunday, August 6 @ 6 p.m.
12th Saturday, August 12 @ 10 a.m. to 3 p.m.
12th Saturday, August 12 @ 2 p.m.
13th Sunday, August 13 @ 2 p.m.
17th Thursday, August 17 @ 6-8 p.m.
19th Saturday, August 19 @ 2 p.m.
20th Sunday, August 20 @ 2 p.m.
26th Saturday, August 26 @ 2 p.m.
27th Sunday, August 27 @ 2 p.m.
2nd Saturday, September 2 @ 2 p.m.
4th Monday, September 4 @ 2 p.m.
16th Saturday, September 16 @ 2 p.m.